The time when Aristocrat released its Queen of the Nile slot seem as distant past and this game may strike you as outdated in comparison with all the titles available online today. However, this slot machine was revolutionary at the time of its launch as it introduces one of the most popular bonus features when it comes to slot machines. Today you can hardly find a slot title which does not offer the free spins feature and it is by far the most popular type of bonus game among players. Regardless of their number, players around the world are happy when they can hit wins without a single cent spent and this is what free spins enable them to do. Classic free spins are also obsolete as nowadays during free games you can benefit from additional bonus features such as multipliers, expending wilds and more. Actually, this was introduced with Queen of the Nile awarding 15 spins with all payouts tripled and now you can take advantage of more and more rewarding free spins during which your winning chances are significantly enhanced thanks to special bonus features available. Here we present you with a list of the best slot machines with free spins feature which can help you win big without risking your own money. 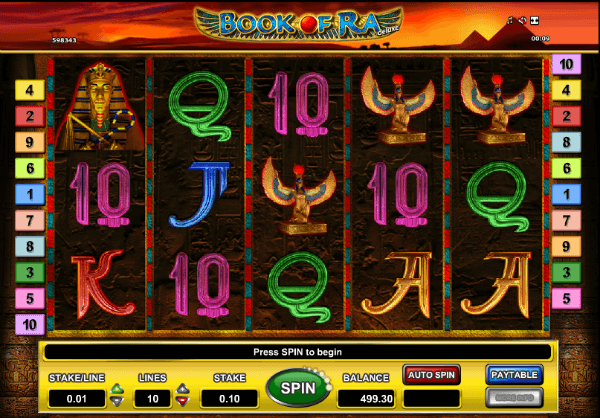 Book of Ra is a 5-reel 9-payline video slot developed by Novomatic. Themed on ancient Egypt and its mythology, the Book of Ra slot is huge at both land-based and online casinos due to its free spins feature triggered by three Book Scatters. When the feature is triggered, the pages of the book will flip until they show a randomly determined symbol which will expand to cover all the positions on the reel during 10 spins awarded. That’s how you can benefit from identical symbols populating your reels and delivering big payouts. 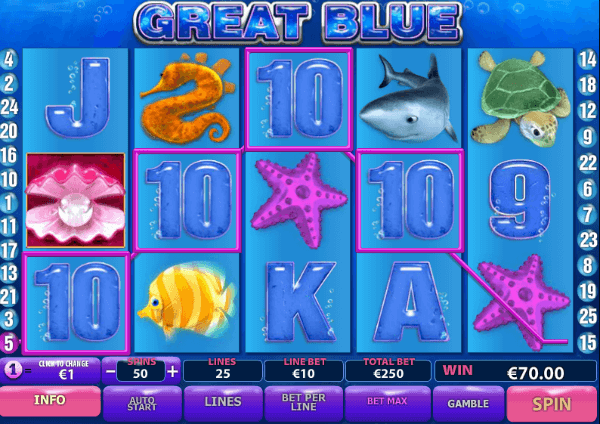 Great Blue (free play) is one of the oldest Playtech-powered slot machines inspired by the underwater life. It is played at 5 reels and 25 paying lines and features Wild which doubles your payouts whenever it is included in a winning combination. Players can unlock up to 33 free spins during which payouts will be subject to up to 15x multipliers. If you are ready to meet the outlaws wanted dead or alive, this NetEnt’s release can be a perfect fit for you. 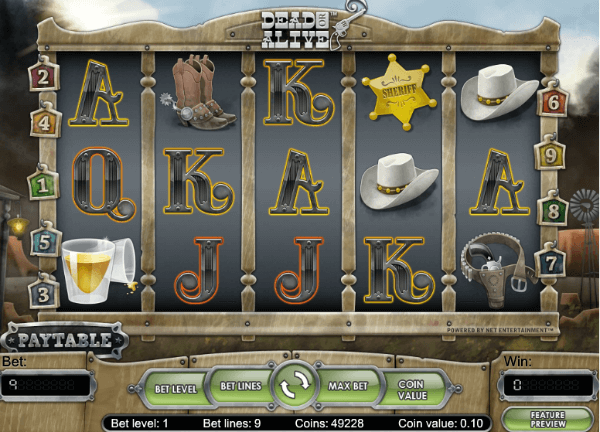 Not only for its appearance which suits the theme of the game inspired by the Wild West, but also for its bonus features, the Dead or Alive slot is one of the most popular among online casino players. Land three or more Scatters and you will activate 12 free spins during which you can create numerous winning lines thanks to sticky Wilds remaining at their position till the feature ends. What’s more, sticky Wilds appearing on the reels during the feature will activate 5 additional spins. 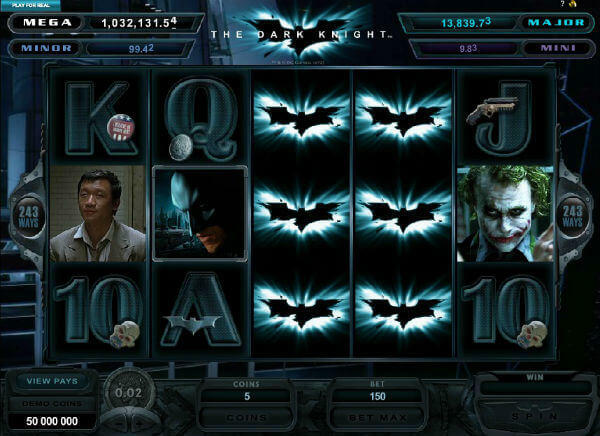 The Dark Knight Rises (free play) is a 5-reel 243-payline sequel to the Microgaming slot The Dark Knight. The slot introduced a few innovative bonus features such as a split Wild. When the Fight mode is triggered, Batman, a superhero, and Bane, a villain, will engage in an epic fight during which free spins and multipliers will be awarded. After triggering the bonus feature, you will be rewarded with 10 free spins with the free games and multipliers won during the Fight mode added. You will be offered to choose Bane or Batman mode of the game to and depending on your choice you will benefit from additional features such as the Rolling Reels feature, Super Stacked Wilds or the Extra Wild Blast feature. 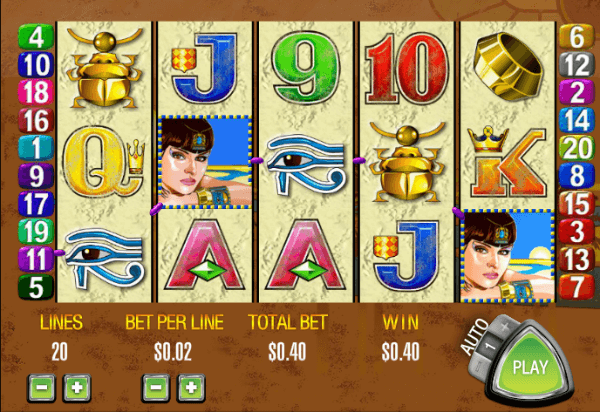 Another slot machine on our list which is inspired by Egypt is Cleopatra 2 released by IGT. 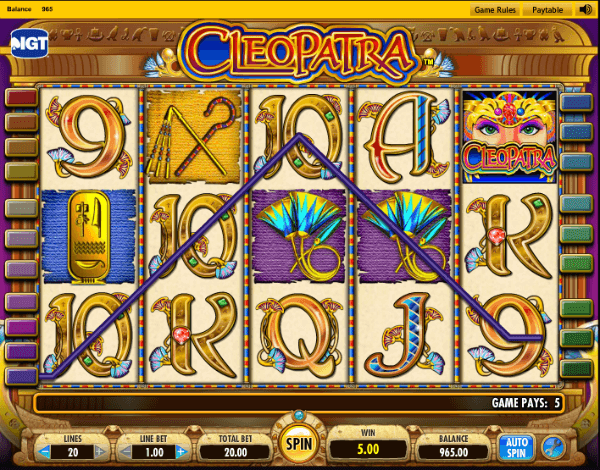 The 5-reel 20-payline slot is a sequel to the original game Cleopatra. Once the feature is triggered, you will be awarded a number of free games depending on the amount of triggering Scatters, from 5 up to 20 free games. Pick a box before the feature starts to reveal the number of free spins. During the feature the bonus multiplier starting at 1x will increase by 1 with each spin. The maximum amount of free spins you can win is 50. Play Free Cleopatra slot here. 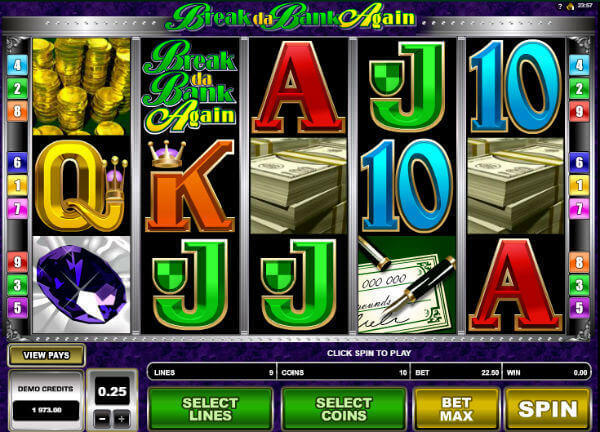 Break da Bank Again in is a Microgaming-powered 5-reel 9-payline video slot themed on banks and money. While its Wild acts as the 5x multiplier, Scatter depicted as the Vault triggers up to 25 free games. During free spins payouts from all the winning combinations completed with Wild are subject to the 25x multiplier. When it comes to the multiplier value, you won’t find many slots that offer such huge multipliers. The first place on our list is reserved for the Aristocrat Queen of the Nile slot. 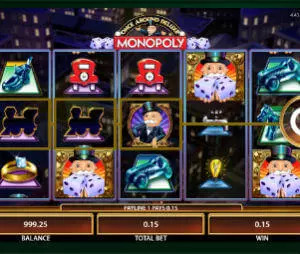 It doesn’t mean that it’s the best slot machine with free spins at the moment, but at the time of its release, its free spins feature was groundbreaking as it allowed players to win without risking their own money. You have to respect that. The rest is history. The Egypt-themed game is a home to two bonus symbols, Wild Queen of the Nile and the Scattered Pyramid. Whenever Wild is included in a winning combination it will deliver a doubled payout. Landing Scatters on the reels will result in instant wins going up to 400x your line bet and you will be awarded 15 spins during which all your winnings will be tripled.